The OUKITEL K10000 Android phone has a 10,000mAh battery, and it can reportedly be used as a power bank to 'reverse charge' other mobile devices, including as many as three dead iPhone 6s Plus handsets. Last month, I came across a short news article that featured a rumored Android smartphone with a 10,000mAh battery. The story caught my eye, because I'd just attended a press event for Verizon's latest DROIDs, the Turbo 2 and Maxx 2. The new DROIDS were marketed as having some of the best battery life in the industry, or "up to 48 hours" of life, according to Motorola and Verizon Wireless. The DROID Turbo 2 has a 3,760mAh battery, and the MAXX 2 battery capacity is 3,630mAh. 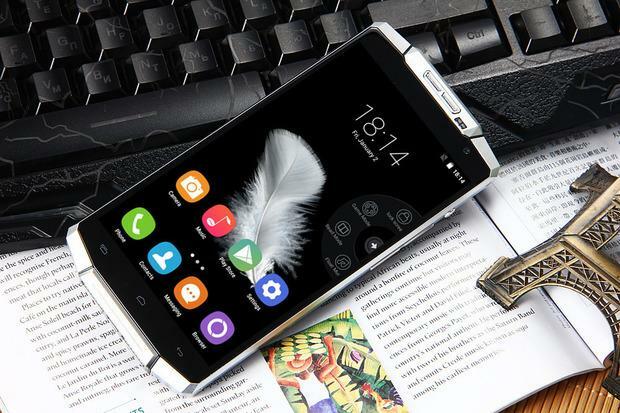 The OUKITEL K10000, is the "world's largest capacity battery smartphone," according to its manufacturer, and it has a power pack that's 270 percent larger than the DROID Turbo 2. I didn't think much of the article last month, because the gadget was little more than a rumor, and OUKITEL had recently released "leaked images" of its own phone, which is odd to say the least. Today, the K10000 is listed for sale for $239.99 on GearBest.com; apparently 194 people have already pre-ordered the gadget, which will ship "within 3 to 5 business days." I won't dig too far into the tech specs, because this phone is all about the battery, but OUKITEL says it runs Android 5.1, has a 5.5-inch screen with a 720p display, and 13MP rear and 5MP front cameras. It can also reportedly "reverse charge" other devices, making it a power bank of sorts than can fully power up three dead iPhone 6s Plus smartphones, according to Gadgets.NDTV.com. GearBest.com, the site that's selling the OUKITEL K10000, also has a number of images and a hands-on video, featuring the boxy battery behemoth and, best of all, one hell of hand model in fingerless cycling or weightlifting gloves. Yep. It's worth noting that this new device isn't listed anywhere on OUKITEL's website, which should be a bit of a red flag. I also can't vouch for its quality, and the maxim, "you get what you pay for," holds particularly true for random Android devices. So keep that in mind if you're actually thinking of buying this thing. That said, battery life is one of the biggest challenges in the mobile world today — this week Apple released an awkward battery case to boost iPhone 6 and 6s battery life — so the idea of a 10,000mAh battery is admittedly appealing. The OUKITEL K10000 is to smartphones what Hummers are to SUVs — but something tells me that shiny new H3 may be more reliable.